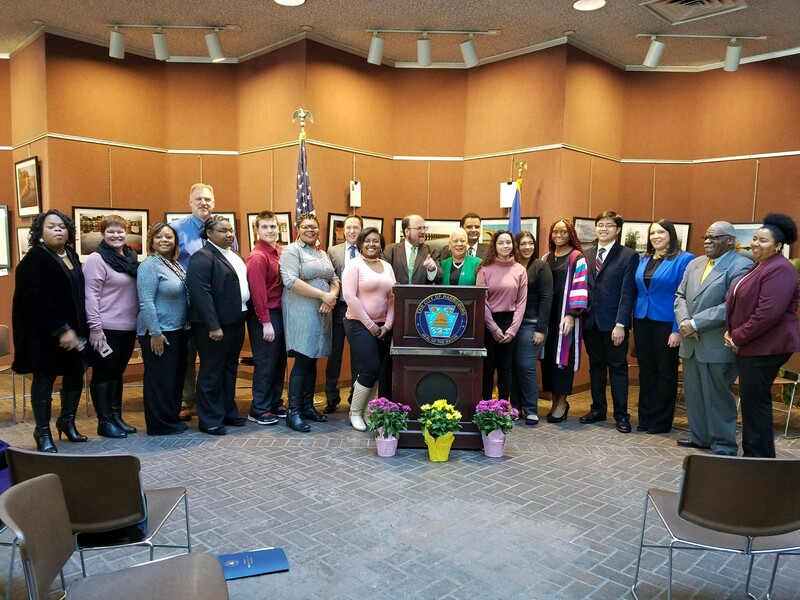 Newly installed Judge Hanif Johnson led swearing in ceremonies Tuesday for Mayor Eric Papenfuse, City Treasurer Dan Miller and members of the Harrisburg City Council during inauguration ceremonies held Tuesday, Jan. 2, 2018 in the MLK Government Center. Mayor Papenfuse was re-elected to a second, four-year term in November. During the inauguration ceremonies he recommitted to another four years of service with vision of making Harrisburg a more prosperous community. 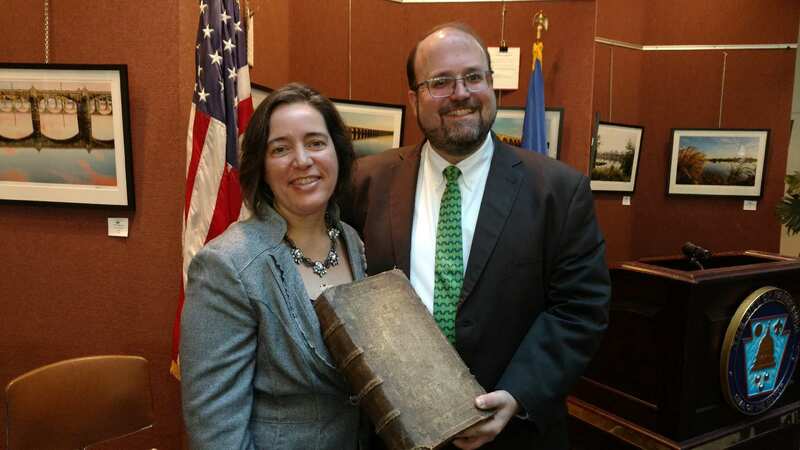 He took the oath of office on an historic Bible dating back to the Protestant Reformation. “As Mayor of this historic and majestic city, I vow to do all in my power to fuel the renaissance that has enveloped our community, and to make our citizens proud to call Harrisburg their home,” Mayor Papenfuse pledged. He expressed appreciation to the citizens of Harrisburg for their support of his administration and for the hard work they put into saving the city from financial catastrophe. Harrisburg Poet Laureate Rick Kearns, the city’s first Latino Poet Laureate, offered a special tribute for the 2018 Inauguration. Members of the Harrisburg Youth Symphony Orchestra provided musical entertainment, and students from throughout Harrisburg were inaugurated into a new Harrisburg City Council Youth Commission. Mayor Papenfuse, Council President Wanda Williams with members of City Council Youth Commission and Harrisburg School officials. The Harristown Development Corp. provided refreshments for the historic occasion. The Rev. James Jackson, Pastor of Goodwin Memorial Baptist Church, offered the invocation and the Rev. Mack Granderson, Pastor of the Derry Street United Methodist Church, provided the benediction. HARRISBURG: In response to the tax law recently passed by Congress, the City of Harrisburg Office of the Treasury will accept prepayment of 2018 Harrisburg City real estate raxes beginning Dec. 27. City Treasurer Dan Miller says the City’s Treasurer’s office will receive payments Dec. 27-20, 2017. Payments postmarked December 31, 2017 also will be accepted as paid in 2017. In order to qualify for 2018 prepayment, taxpayers must have no outstanding tax or utility balances with the city. A copy of the 2017 city real estate tax must accompany payment. The 2018 pre-payment must be made in the exact amount of the 2017 flat invoice amount, less the 2 percent discount. All checks should have “2018 prepayment” noted on the front of the check. Prepayment of city real estate tax is not standard procedure. The City is making a special effort to accept these payments to assist city taxpayers. The strict prepayment requirement are necessary to ensure all federal rules are followed. For more information, call 311 or email Joyce M. Davis Jdavis@harrisburgpa.gov or call 717 255 3015. 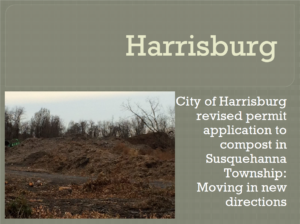 The City of Harrisburg has drafted a new plan for a composting facility on property it has been provided in Susquehanna Township. The plan would allow the City to recycle leaves, branches, and brush in an environmentally friendly area that would also serve as an educational center for students. The City has revised the plan after meetings with residents in the Township and in the City of Harrisburg. The result is a plan that will meet the City’s needs for a recycling center while addressing the concerns of area residents. School District owns 41 acres in the vicinity of the composting site. The proposed composting site will only accept processing for leaf waste, garden waste, yard waste, tree trimmings, and shrubbery. The City will include a 6-acre green belt buffer zone to allow space for wildlife and vegetation to continue to flourish. NOTE: NO FOOD WASTE WILL BE ALLOWED AT THE SITE. HPD Took Kids on “Shop With A Cop” Day! Police from several agencies throughout the region partnered with the Harrisburg Police Athletic League to take youth on the annual “Shop with a Cop” program. Police and youth met at the Heinz-Menaker Senior Center and enjoyed a hearty breakfast prepared by volunteers before heading out to Walmart to purchase Christmas presents for the children’s family. Everyone returned to the Heinz-Menaker Senior Center to wrap the presents. This year the Harrisburg Bureau of Police participated in a “No Shave” November. Officers were permitted to grow a beard from mid-November until January 2nd for a donation of $25. The department raised $2,000 for the “No Shave” November and will present the money to HPAL during the “Shop with a Cop” event. 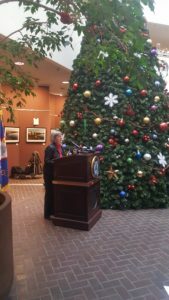 “Peace on Earth, Peace at Home” was the theme of the 2017 Giant Holiday Tree Lighting Ceremony at the MLK Government Center, hosted Tuesday, Dec. 5 by the Mayor’s Interfaith Advisory Council. Giant Foods provided refreshments for the event, and Samantha Kreps, Manager, Public and Community Relations GIANT Food Stores/MARTIN’S Food Markets, offered words of inspiration for the holiday season. 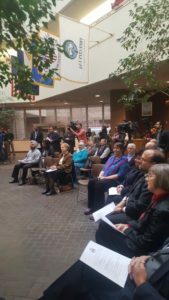 Mayor Papenfuse and Members of his Interfaith Advisory Council at 2017 Giant Holiday Tree Lighting Ceremony in the MLK Government Center. Rev. 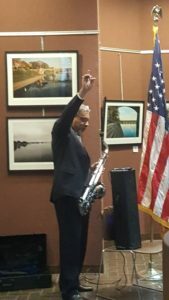 Manny Valentin, of Derry Street United Methodist Church, provided musical inspiration. Faith leaders from throughout the region spoke at the ceremony to officially light the 26-foot tall tree, which Giant Foods donated to the City in December 2014 during Mayor Papenfuse’s first year in office. Rev. Sandy Strauss, Director of the PA Council of Churches, served as MC. Click HERE for Mayor’s Papenfuse’s remarks. Mayor Eric Papenfuse expresses his gratitude to veterans throughout the nation on Veterans Day, and especially to Harrisburg residents who have served our nation with honor. Mayor Papenfuse extended special thanks to Harrisburg’s veterans and called upon residents of the City take time on Veterans Day to thank their friends, neighbors, and relatives who have served in the armed forces. For more information, contact Joyce M. Davis, Director of Communications for the City of Harrisburg, at [email protected] or at 717 255 3015. Mayor Eric Papenfuse will announce the completion of repairs to the Rebirth Fountain in Reservoir Park at a press conference at 11 a.m. Tuesday, Nov. 14, 2017, at the fountain. Repair of Rebirth Fountain was recently completed as a result of a years-long collaboration among civic groups and the City of Harrisburg. The fountain was installed in 1994 but had been dormant for years. It will resume normal operation in the spring of 2018. The Harrisburg Parks Foundation and the Committee enlisted volunteers from the Plumbers and Pipefitters Union Local 520 and the Electricians Union IBWE Local to inspect the condition of the fountain equipment and to make the necessary repairs. For more information, please contact Joyce M. Davis, Director of Communications for the City of Harrisburg, at [email protected] or at 717 255 3015. Harrisburg, PA – Mayor Eric Papenfuse will announce the start of a project to repave several sections of North Third Street in Harrisburg at a ground-breaking ceremony at 10 a.m. Thursday, Nov. 9, 2017, at the corner of Third and Sayford Streets. Doug Lamb Construction Inc. has been contracted to do the repaving. The City of Harrisburg is sharing costs for the work with Capital Region Water (CRW). The City will pay an estimated $3.5 million, with CRW paying the remaining $2 million. The project also will include new Americans with Disabilities Act (ADA) compliant curb ramps, traffic signal improvements and new street trees and tree pits. Residents may experience some inconvenience during the work, as it will be necessary to prohibit or to alter parking on the street during construction. “No Parking” signs will be posted approximately 24 hours in advance of the start of work. Mayor Eric Papenfuse will hold a press conference at 11 a.m. Monday, Nov. 6, in the Atrium of the MLK Government Center, 10 N. Second St., to announce the 2017 Holiday Parade that will be held at noon Nov. 18 in Downtown Harrisburg. This year’s parade theme is “A Season of Giving”. Mayor Papenfuse extended his appreciation to “Visit Hershey Harrisburg,” for serving as Title Sponsor of the Harrisburg Holiday Parade. “Without their support, we would not be able to put together this wonderful parade,” Mayor Papenfuse said. Road closures will begin at 7 a.m. Nov. 18 and end at approximately 3 p.m. The Market Square garage will offer $10 all-day event parking for the parade. In addition to the discounted garage rate, parade attendees can utilize the ParkMobile App to get up to 4 hours of free street parking using the “LUVHBG” code. Following the parade, people can join Santa for hot chocolate and cookies in Strawberry Square, followed by an awards ceremony. Trophies will be awarded to the top Step and Drill Team Units and cash prizes will be given to the top high school marching bands. Special thanks to all of our sponsors, including PSECU, Downtown Improvement District, Mixed Up Productions, Belco Community Credit Union and Turkey Hill Minit Markets.